An introduction to fluorescent minerals, types of fluorescence, light sources, activators, extensive identification guide with photos, how to find fluorescent minerals and much more. 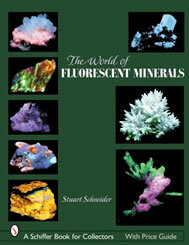 This book contains over 160 pages of color photographs featuring fluorescent minerals under daylight and UV illumination. This book is a 8 1/2" x 11" paperback with 192 pages. Geology.com Store also offers Fluorescent Mineral Collections and Ultraviolet Lamps.